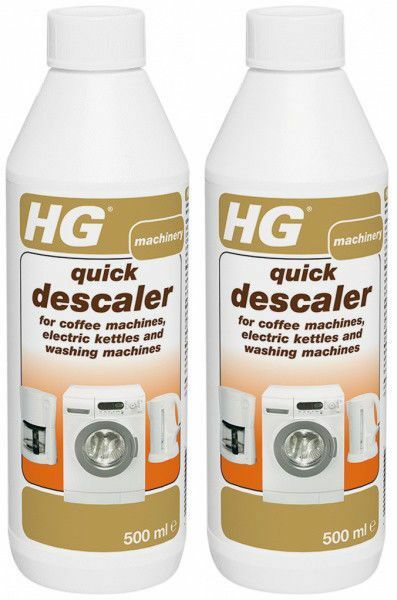 HG quick descaler for coffee machines, electric kettles and washing machines is an effective descaling fluid which has been specially designed for the removal of scale from hot water apparatus such as: coffee-makers, electric kettles and washing machines. If allowed to build up, limescale and other deposits will make heater elements use more energy, meaning that it runs less efficiently and will wear out more porcelain cleanerly. Furthermore, in coffee makers, scale does nothing to improve the taste of the coffee. The directions for use of HG descaler vary with each heating appliance, and for thoroughly removing all traces of scale, the hardness of the water is a key factor. The correct application of HG descaler is on the packaging.